Hey folks - Back at the workbench again - Had an idea for a new rune shaper model! 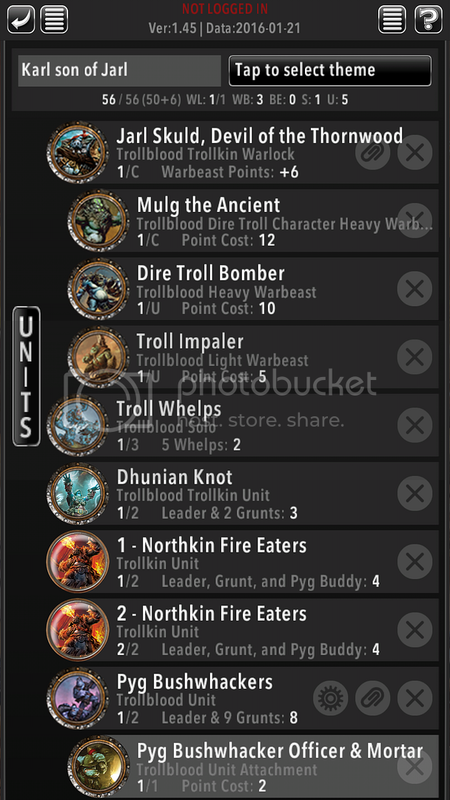 I have one unit that I will build the models nearly stock, but I need three more to compliment them and make up the six bodies I need for 2 units. As I'll probably mix the stock ones and the custom ones across the units (I think this may increase recognisability and reduce opponent confusion) I will also need to make sure the aesthetic is clearly connected as well. 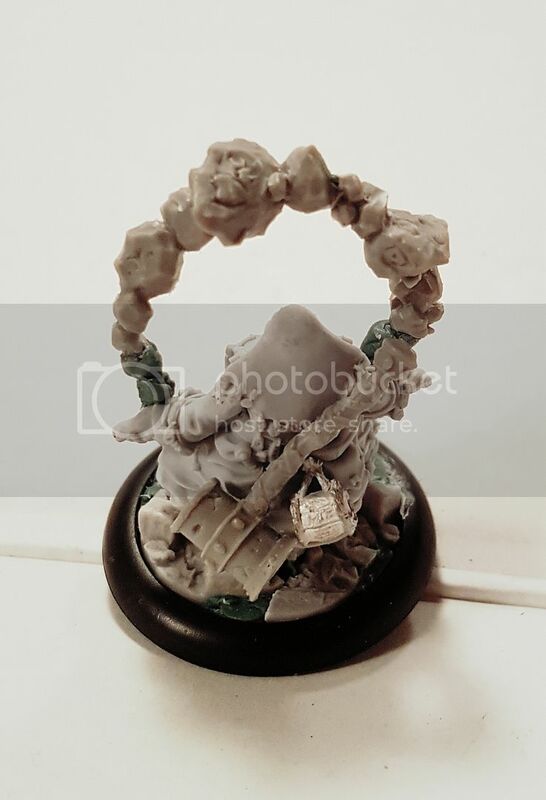 So like last week I grabbed one of my extra Dhunian Knot models - the seated one - and made two very simple additions to emphasise the Runeshaper design elements - I first took a piece of the the magical rock formation effect from the runeshaper set and bent and reworked it so that with only a few extra greenstuff rocks it reached from her one hand to the other - nothing screams runeshaper like magical rock shennanigans! Then I strapped a runeshaper hammer to her back (bits ordered from PP) - clearly arming her to match her peers. With just these two little tweaks and the fact that she is already covered in small rock medallions - she fits perfectly into the runeshaper unit look. 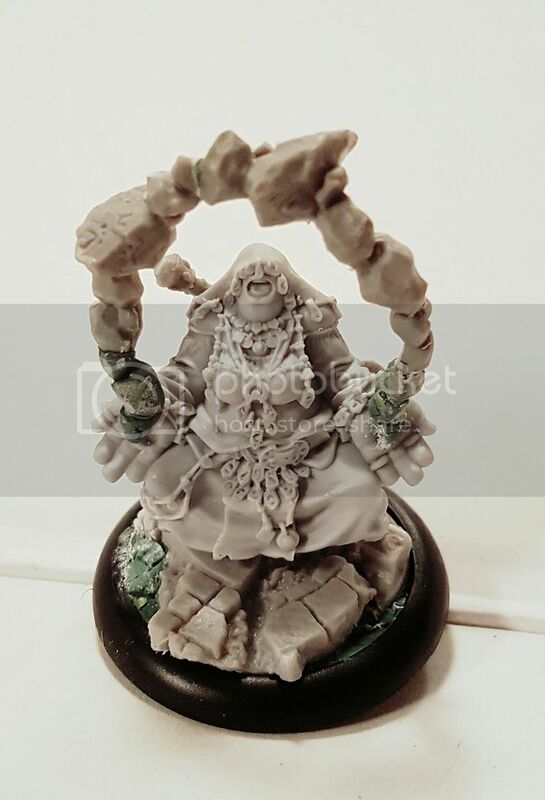 All that was left was to choose a base from my CMON basing system and it appears from frontal views as though she is floating above the stone. Cool stuff - easily done! She will be a treat to paint!